Is China Getting Too Close To Israel? China is constructing seaports at two sites where the US 6th Fleet deploys, in Haifa next to Israel’s main naval base and Ashdod near Tel Aviv, prompting concerns about China’s military potential in the Mediterranean Sea and Middle East. “The civilian [Chinese] port in Haifa abuts the exit route from the adjacent [Israeli] navy base, where the Israeli submarine fleet is stationed and which, according to foreign media reports, maintains a second-strike capability to launch nuclear missiles,” Israel’s Haaretz media reported. “No one in Israel thought about the strategic ramifications,” Haaretz said in September. The guided-missile destroyer USS Arleigh Burke visited Haifa on October 25 in support of the 6th Fleet which is headquartered in Naples, Italy. Shanghai International Port Group (SIPG) signed the Haifa contract in 2015, began construction in June, and is to operate the Bayport Terminal for 25 years starting from 2021. SIPG signed memorandums of understanding with U.S. ports in Seattle, Washington in 2006 and Georgia Ports Authority in 2004, plus Barcelona, Spain, in 2006. SIPG also works with European ports in Rotterdam, Hamburg and London, and two ports in Japan, its website said. China Harbor Engineering, one of China’s biggest government-owned enterprises, is meanwhile constructing a port at Ashdod, 25 miles (40 kilometers) south of Tel Aviv. “At $3 billion, this is one of the biggest overseas investment projects in Israel, ever, and also one of the biggest for the Chinese company, China Harbor Engineering,” wrote Arthur Herman, senior fellow at the Washington-based Hudson Institute think tank in November. “Ashdod on the Mediterranean coast is the destination of fully 90 percent of Israel’s international maritime traffic,” Herman said. Ashdod’s current port hosted the USS Ross guided-missile destroyer in October which also supports “U.S. national security interests in the U.S. 6th Fleet area of operations,” a USS Ross public affairs officer said on the Navy’s website. “This is an historic moment,” Israeli Prime Minister Benjamin Netanyahu said in 2017 when he joined Chinese officials to lay the cornerstone of the Ashdod port. Israel’s Transportation Ministry and the Ports Authority permitted construction of the Chinese ports at Haifa and Ashdod “with zero involvement of the [Israeli] National Security Council and without the [Israeli] navy,” Haaretz said. “The first [concern] is over Chinese control of strategic infrastructure and the possibility of espionage,” the London-based Economist magazine reported in October. 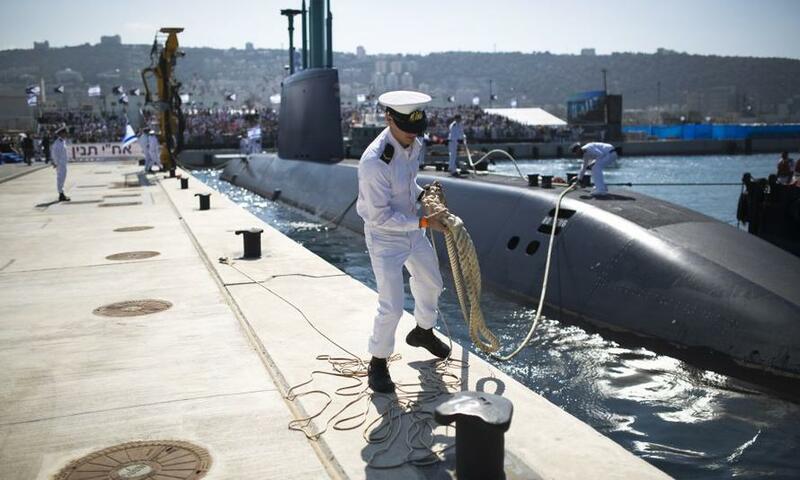 “Israeli submarines, widely reported to be capable of launching nuclear missiles, are docked there [at Haifa]. Yet the deal with the Chinese firm was never discussed by the cabinet or the national security council, a situation one [Israeli] minister described as astonishing,” the Economist said. “There are skeptics in several Israeli political parties and among former national security officials, who warn of potential security issues and possible friction with the United States resulting from Chinese involvement in Israeli infrastructure projects,” wrote Elliott Abrams, senior fellow for Middle Eastern studies at the Washington-based Council on Foreign Relations and former deputy national security advisor to President George W Bush. The ports form part of China’s international, multi-billion dollar Belt and Road Initiative. The Belt and Road project would link China with countries elsewhere in Asia, the Middle East and Europe along lucrative trading routes across land and sea, with Ashdod serving as a crucial port for seaborne trade with Europe, Abrams said. China’s Haifa and Ashdod ports are part of “an ambitious trans-Asian strategy to pursue three key resources for China’s future greatness: petrochemicals, consumer markets, and advanced technology,” he said in his 2018 brief. Middle East oil and gas fuels China’s growth. “There are some who go as far as to deem any Chinese economic involvement in our region as a threat to our interests and a danger to our economic independence. These statements are damaging to relations between the countries. Prime Minister Netanyahu meanwhile hosted China’s Vice President Wang Qishan along with Jack Ma, CEO and founder of the e-commerce giant Alibaba, in Jerusalem in October. Their summit “reflects the growing ties between our countries, our economies, our peoples,” Netanyahu said. In 2017, Netanyahu visited Beijing and met Chinese President Xi Jinping. China established diplomatic relations with Israel in 1992 when Deng Xiaoping and Yitzhak Rabin were in power, and continues to support Israel during votes in the United Nations.